The BRA issued a draft Downtown Waterfront Public Realm and Watersheet Activation Plan for public review and comment. The plan looks at waterfront activation, programming and public amenity concepts for the section of Boston's waterfront extending from Long Wharf to the James Hook Lobster property. The comment deadline is May 2, 2014. The Public Realm and Watersheet Activation plan will assist in the development of a more extensive Municipal Harbor Plan for the Downtown Waterfront, expected to be completed by the end of 2014. The Municipal Harbor Plan will address how new development within the planning area will promote the City's objectives for its waterfront and the goals of the State's public tidelands regulations. A project overview will be given at the Fort Point Neighborhood Association's monthly meeting on April 29, 2014. A waterfront district accessible to all by bike, transit, foot, and boat. Clearly defined connections to the Greenway, the harbor, Quincy Market, the North End, the Financial District, and the Innovation District. A district and watersheet that are resilient to climate change, designed and built to withstand inundation and storm surges. Four-season destinations and programming that are welcoming to Bostonians and visitors of all ages and support the growing residential community. A district and watersheet that is flexible and can accommodate innovative uses in the future, and supports equally the residential, business, and visitor communities. Public comments can be submitted by emailing Chris Busch, BRA Senior Waterfront Planner, by May 2, 2014. Boston City Council President Bill Linehan and Councilor-At-Large Michael Flaherty file order for a hearing regarding the rezoning of South Boston in response to over development. Height, density, open space and parking issues are creating quality of life issues for South Boston residents. Infrastructure improvements in public transportation and parking lag behind. The majority of the zoning laws for South Boston date back to 1964. Since then the neighborhood has undergone vast changes in population and demographics. The pace of development require frequent community meetings, several weekly, burdening the residents of South Boston. The Boston City Council will hold a hearing on May 22nd at 1 pm in the Iannella Chamber, 5th floor of City Hall to address the rezoning of South Boston. Representatives from the City of Boston, South Boston neighborhood associations and others are invited to attend. Rezoning Order presented at Boston City Council Meeting. Thomas Grillo's article, South Boston's two city councilors file measure to rezone the entire neighborhood, published in the Boston Business Journal on April 22, 2014. The Boston Business Journal is conducting a poll "Do you think they are on target?" May is National Historic Preservation month. Boston is celebrating the month with a look at the city's buildings and grounds. The Boston Landmarks Commission will be giving tours, talks and promoting other activities throughout the City including a walking tour of the Fort Point Channel Historical District and Fort Point Spring Open Studios. 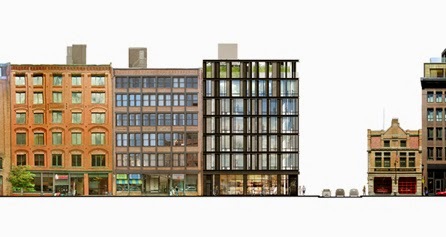 Reinvestment in Boston’s only intact warehouse district has in recent years transformed the area into a vibrant and pedestrian friendly mixed-use neighborhood. How did an area dedicated to industry become such a desirable neighborhood in which to live and work? This walking tour will look more closely at how new construction, adaptive reuse, and revitalization of open spaces have allowed Fort Point Channel to live on beyond its industrial past – and how the neighborhood’s status as a historic district has supported this change. This tour will be led by City of Boston Preservation Planner Erin Doherty. Following the tour, continue the conversation over a pint at an informal gathering in one of the district’s new establishments, Row 34. Meeting place confirmed at time of reservation. Free and open to the public, pre-registration is requested. Contact Erin Doherty at erin.doherty(at)boston.gov before May 2 to reserve a place. 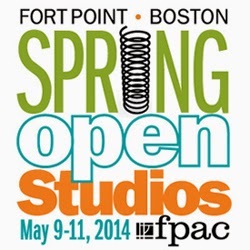 Visit artists’ studios in Fort Point’s historic warehouse buildings during Fort Point's Spring Open Studios Weekend. Click here for a complete catalog of events by the Boston Landmarks Commission. In January, the Fort Point Neighborhood Association conducted a community survey to determine top neighborhood issues. The monthly meetings address these top neighborhood issues by bringing in industry experts and City and State officials. The April meeting will be looking at issues surrounding crosswalks, sidewalks and public safety, bike lane safety and integration, tree replacement and plantings, and the A Street/Summer Street stairway and underpass.Our experts and special guests are: Jonathan Greeley from the Boston Redevelopment Authority and Para Jayasinghe from the Boston Public Works Department. In advance of Historical Preservation month in May, we are pleased to have Erin Doherty from the Boston Landmarks Commission to talk about the Fort Point Historic District and upcoming local historic preservation events. All Fort Point residents and businesses are invited to attend. The Seaport World Trade Center is hosting the U.S. District Court Naturalization Ceremony on Thursday, April 17, 2014. Based on previous ceremonies, this event is expected to bring roughly 7,000 visitors to the area. The ceremony is scheduled to take place from 11AM-4PM, although visitors are expected to arrive as early as 9AM. Local parking facilities surrounding the Seaport WTC may reach capacity. It is advised that commuters who usually drive to the area consider using transit on Thursday, April 17 or shifting their arrival time if possible. 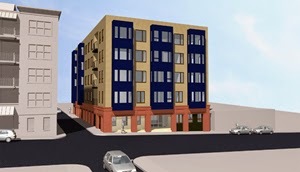 East Way Development LLC (the Proponent), seeks to redevelop the approximately 7,364 square foot parcel in the South Boston neighborhood.The 39 A Street Project will exist of the demolition of the existing single story structure and the construction of a new, five story residential building containing 24 residential condominium units and 30 off street parking spaces. Mayor Marty Walsh’s Boston Shines event is a neighborh ood clean-up to celebrate spring and Boston’s neighborhoods. Please join the Fort Point Neighborhood Association (FPNA) in this neighborhood event to make Fort Point Shine! Lunch is included for company employees planting tree circles and panel vines. To sponsor and to volunteer, please visit FPNA. After Party will take place in Wormwood Park starting at 5 pm. Food and refreshments are generously donated by Fort Point restaurants and local businesses. The City of Boston will provide rakes, trowels, gardening gloves and a free t-shirt! If you have any questions, please contact Cam Sawzin at cam.zin(at)verizon.net or Charles Joseph at charlesjos(at)aol.com. The Boston City Council Special Committee on Small Business, Entrepreneurship & Innovation wants to hear from small businesses owners on their experiences with the City of Boston permitting and licensing process. Join General Assembly, Friends of Fort Point, and WeWork at this bi-monthly event celebrating the movers, shakers and makers of Fort Point. Hear from local entrepreneurs as they share their experiences turning their passion projects into businesses. On tap for April is Jean Claude Tetreault, Co-Owner and Founder of Trillium Brewing Co. He'll share how in one year, his family owned and operated brewery in Fort Point developed a cult following of devoted fans who visit their Congress St. brewery to fill growlers of craft beer made with native ingredients and artisan practices. Of course, Trillium beer will be sampled. General Assembly will also be hosting a Spring Open House on Monday, April 21, 2014 from 6-8:30 pm. More details. 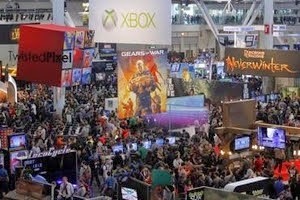 The gaming convention and expo, PAX East, will be held at the Boston Convention & Exhibition Center through April 13, 2014. Due to the large number of attendees, there will be a need for off-site parking during this event. Currently, the MCCA Transportation Department plans to use the following lots and garages in order for overflow parking. At this time we anticipate that at least the first two locations will be needed. 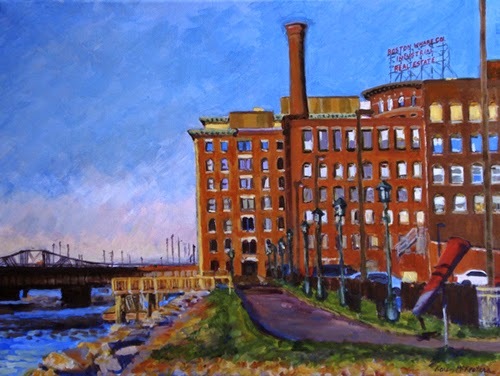 The Midway Channel Gallery presents the "Changing Faces of Fort Point," an exhibition running through April 30, 2014. "Changing Faces of Fort Point" shows reaction to the decades long redevelopment of a former warehouse district by the artists who live there. The exhibition serves to join the historical context with the contemporary viewpoint by creating a bridge through art. The exhibit illustrates not only the visual changes to the urban landscape, but also the transformation and reincorporation of early industrial materials in new ways. "Music of Fort Point Theatre Channel"
Featuring: Shalaye Camillo, Theresa Chiasson, Kelly Chick, Alissa Cordeiro, Lindsay Eagle, Chris Everett, Paola Ferrer, Maria Hendricks, Robin JaVonne Smith, Nick Thorkelson and Peter Tork, and the music of Brendan Burns, Alyssa Jones, Anton Karas, Nick Thorkelson, and Mark Warhol. Exhibition visual artists: Mario Avila, Martin Berinstein, Laura Davidson, Dawna Davis, William Frese, Jacob Higginbottom, Eric Levin, Karen McFeaters and Jose Santos. Curator: Liliana Folta. More details. 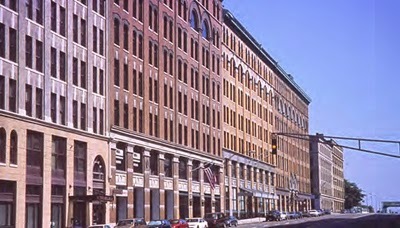 The gallery is located within Midway Artist Studios at 15 Channel Center Street Boston, MA 02210. 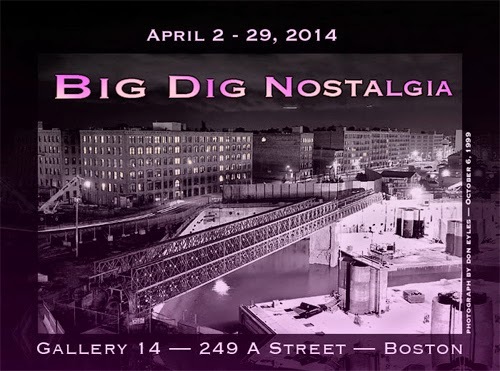 Gallery 14 presents "Big Dig Nostalgia" running through April 29, 2014. It has been ten years since the Big Dig departed from our neighborhood, and some of us look back with nostalgia to the time when Fort Point was still "owned" by the artists and were stimulated every day by the muscular art of civil engineering as it took place around us. Our building at 249 A Street was literally "touched" by the Big Dig. Some of us are still processing the images and the experience. Rebecca Leviss Dwyer, Don Eyles (curator), Anton Grassl, Dan Osterman, Lenore Tenenblatt, Nan Tull, George Vasquez, and Valda Zalkalns. Opening Night: Thursday, April 10, 2014 6:00 - 8:00 pm. Gather hosts their third Welcome Wednesdays with special guests, Caught in Southie on Wednesday, April 9th from 5:30 pm to 7:00 pm at District Hall. District Hall is located at 75 Northern Ave Boston, MA 02210. The free event will feature a pop-up shopping event highlighting some of South Boston's most popular retailers! Shops include Pretty Reckless, KuDeTa, Covet, Closet Connection and Habit. Salon De Cheveux will be hosting a Beauty Bar featuring buns, braids & spring make-up. A raffle will be held to benefit the families of Lt Walsh and Firefighter Kennedy. The first 200 guests will receive a Caught in Southie tote bag filled with special gifts. Food will be served courtesy of Gather. Beer and wine will be available from Brew, with samples from The Traveler Beer Company. Grand Ten Distilling will be creating craft cocktails to sample. 338 Congress is on the Fort Point Channel Landmarks District Commission agenda for this Thursday April 10, 2014 at 7:15pm in Room 709 of Boston City Hall. This will be a public hearing for support of Redgate Real Estate Advisors' (the developer) request for a Certificate of Appropriateness for the project. There will be a formal request by the Commission for people to speak in favor of or against the project design of the residential condo building and its appropriateness to the neighborhood. The project came before the community in December 2013 and received approval from the Boston Redevelopment Authority (BRA) in January 2014. 338 Project Notification documentation is available at the BRA website. Redgate Real Estate Advisors is asking for support from Fort Point neighbors for their more modern design in historic Fort Point. For those who cannot make the meeting, you may email Erin Doherty beforehand at Erin.Doherty(at)boston.gov with a copy to Lisa Serafin of Redgarte Real Estate Advisors at Lisa.Serafin(at)redgate-re.com. If you have any questions, please contact Lisa Serafin. The public is welcome to attend the Fort Point Channel Landmark District Commission meeting on Thursday, April 10, 2014 at 5:30 pm at Boston City Hall, Room 709. After 5:30 p.m., enter and exit City Hall at the Dock Square entrance on Congress Street (across from Faneuil Hall).